Recently the Poughkeepsie City School District was selected as a recipient of the Empire State After-School grant to bring extended learning time to its students for the next five years. And PFP couldn’t be prouder to be one of the community organization chosen to work with the district on this new project. Since December, we’ve been bringing our love of food and farming to Poughkeepsie’s four elementary schools, and we are expanding our after-school programming to include the middle school and high school as well. This is as large an undertaking as it sounds, and to support this ambitious endeavor PFP has welcomed eight new garden educators to its farm family. I count myself lucky to be a part of this new team that brings together farmers, educators, food rights advocates, local college students, and longtime members of the Poughkeepsie community. Our after-school program is called “Garden Club”, though that simple name doesn’t convey the depth and range of learning we are bringing to our students. The established teaching gardens at each site are the foundation for our work, but as you may know, food connects to virtually any academic discipline and touches so many aspects of our daily lives. Through Garden Club, our students gain practical hands-on skills as they develop positive social and emotional tools that can help them throughout their lives. We connect our lessons to the natural sciences and English Language Arts so that our program supports classroom learning. Most importantly, our club helps create a community where our students can feel safe and comfortable being themselves, where they can develop strong relationships with their peers, and where they can build social skills like kindness and respect. The theme of our program is “FOOD IS LOVE”, and everything we teach connects to this central idea. Cooking and eating food together is a way to build community and show people that you care about them. Sharing recipes is a way to celebrate our own cultural traditions and learn about those that are different from our own. Learning healthy eating habits is a way to love and support our bodies so that we can be our best selves. Growing food in a way that helps rather than hurts our environment shows our love for all living things. These are some of the ideas we are sharing with our youth participants, and we hope that they will in turn share what they learn with their families and community. On a personal note, I am a lifelong resident of the City of Poughkeepsie and I attended Poughkeepsie public schools for my entire K-12 education. To return as an educator to the schools that I attended as a child has been a powerful and humbling experience for me. Sharing the joy of food and love of nature with the next generation of kids in my hometown brings me a level of pride and fulfillment that I haven’t before experienced in my professional life. I am so proud to be a part of the team that brings this educational experience to so many youth throughout the district. Here’s to four more years of transformative learning! That's Chris and her son! It was that first cool day of fall weather, cloudy, and we watched for the rain. Beatrix Clarke, our resident herbalist, had me peeling the onion we were going to have everyone chop up for their fire ciders. She peeled the garlic. We waited until everybody arrived, and then we all introduced ourselves and, as Beatrix asked of us, told something we knew about herbalism. While the answers were varied, they all had to do with alternative options for healing. The power of herbs. This is something I’ve found a lot of people feel. We are still captivated in this modern world by the plant’s ability to heal and protect. Beatrix talked about how, in medieval times, they would salt pack meat with herbs—herbs because everyone would get sick off of the meat otherwise—herbs were the best way to kill the germs. Today, this tradition coupled with the ability of herbs to make certain foods more easily digestible—rosemary for lamb, sage for poultry, both digestive herbs in this sense—makes herbs a staple in most kitchens. A practice that, with centuries of proof behind it, we no longer question the why; why certain herbs go best with certain foods, how much culinary herbal knowledge we actually do possess, without needing an explanation. However, with modern medicine evolving farther and farther outside of the farm and garden, even in an herbal group, we are shy to stake our own claims about how herbs have healed us or helped us to prevent the need for healing in the first place, helped us stomach life’s problems—outside of the kitchen. But today, we are in a tincture kitchen, underneath an outdoor tent, steps away from the herb garden. Next, we go on an herbal walk. Only ten herbs. That’s best for the memory, Beatrix says. First, Beatrix stops right inside the gate, “Careful of the nettles!” I warn. Of course, this is exactly what Beatrix wants to show everyone. The power of nettles. “Really good for you, you can use them like spinach.” I add as we walk, “Make sure to sauté or steam them first!” repeating something Beatrix had told me before when I was skeptical of eating nettles myself. A simple solution used to temper their sting. Then we picked Ricolla Mint for our digestive tinctures. “Five leaves, or more—if you want more.” As Beatrix would tell everyone later, “Tincturing is an art, not just a science.” However, it is an art that requires the scientific categorization of herbs as a base; you have to know what you’re working with before you test age-old recipes. There’s a reason some combinations are tried and true; this form of medicine has been around for a long time. A weak sage tea is good for the stomach, a strong sage tea makes a good gargle for sore throats—but could wreak havoc on your stomach functions for that day. Herbs are like anything else, good in their proper amount. However, it would be difficult to land yourself in big trouble due to herb use, except, in extreme cases, as Beatrix mentioned next with the comfrey. 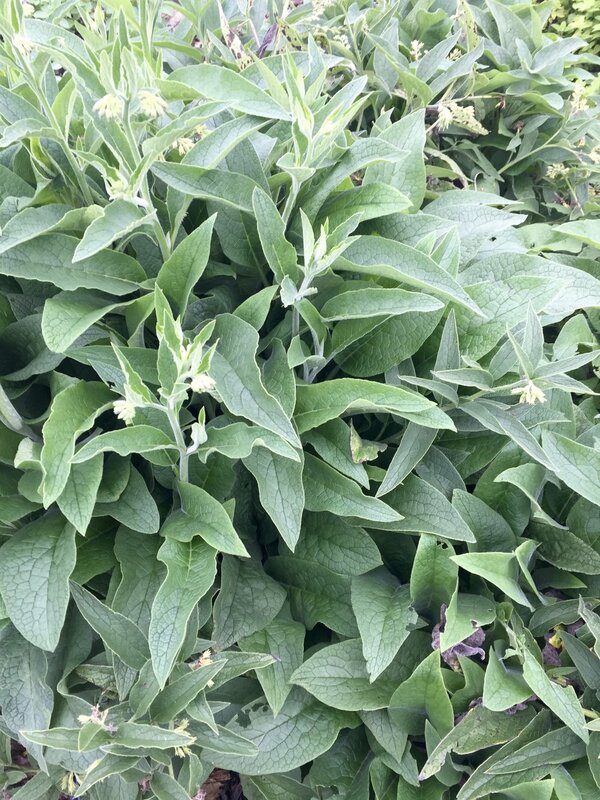 “Comfrey is a wonderful herb, but has recently been blacklisted thanks to some woman who drank a gallon of comfrey extract and ended up in the hospital.” Think about it; imagine drinking a gallon of any kind of extract—like vanilla extract, for instance. The sheer amount she consumed is unbelievable. Beatrix continues, “So we have to make sure to plant it. An act of defiance now.” To this everyone chuckled, but took note. We kept walking, even as a couple raindrops broke on us. “Parsley tea for UTIs; the problem with cranberry juice is all of that sugar. The cranberry makes you slippery so the bacteria slips out, but sugar. Grows bacteria. Parsley is better. No sugar.” We get to the herb wheel. She points out a marshmallow plant, the calendula we use for our PFP salves, and lastly, we pass around some Tulsi, or holy basil, to smell. It smells heavenly; wonderfully heady; like the panacea (or cure-all) it is. Then, we head back into the tent to start working on our tinctures, mint leaves in hand. We all split up into assigned groups at three different stations. Beatrix explains the process for each one before we begin. When talking about the digestive tincture, Beatrix tells us, “Now, for a while at first, you’re going to want to give it a shake, everyday. And talk to it. Tell it good things, ‘you’re a good tincture, you’re going to make my tummy feel better’” Everybody chuckles, “you know, stuff like that. And, I’m serious because—they did a study, studied frozen water crystals—the crystals when you wrote something like ‘love’ on the outside, they froze into these, transformed, beautiful structures.” I remembered listening to a tape of this talk in the car on the way to school everyday in fifth grade. My mother, also an herbalist, loved the science behind the effect of positive words on water cells. We humans carry a lot of water with us. There is something undeniably good about ingesting herbs to heal, relax, or digest. We feel good about it. I think there’s something to that. When I return the tent smells rich with seeds that have been bruised in a mortar and pestle, roots that have been chopped or grated, leaves that have been cut fine. I start with the glycerin tincture. Pouring the hot water over the chamomile and fennel on a cool day is instantly relaxing. We switched stations, giving everyone time to compose one of each kind. An herb garden can greatly improve one’s quality of life, providing everything from seasoning and flavor for food to salves, balms, teas, and herbal remedies. Many herbs can be bought, ready to go in the ground. However, starting from seed can be more cost-effective and fun. Whenever sowing herbs from seed, whether indoors or out, make sure to really soak the seeds after planting until you see sprouts beginning to peek out from the dirt. The best thing for herbs is to have them outdoors, if at all possible. Whether it’s planting them in pots on your porch or doorstep (good for herbs like mint that love to spread, but also for any herb), or sowing them into your garden; herbs enjoy full sun. That being said, you can also plant herbs at any point in the year, from seed or from starts purchased from a garden department (or plant sale), inside your house. This can be a fun way to have culinary herbs right at your fingertips when you’re cooking. In order to make this work you’ll have to ensure that they live in a window that gets a good amount of sun, or you can purchase a grow light. If you plan to grow an herb garden outdoors you’ll want to either start your plants from seed indoors in early spring (when it’s still too cold for many herb seedlings to establish themselves outside) or buy starts when you’re ready to plant. If you choose to start from seed indoors it is important that before transplanting herbs into your garden that you harden them off in their pots/trays, keeping an eye on them and the weather, gradually exposing them to direct sun, cold, and more infrequent watering so that they can acclimatize to being outdoors before going in the ground. If you plan to grow your herbs in pots, make sure that you choose vessels that allow for proper drainage. You can further aid your plants with drainage by first filling the bottom of your pots with a layer of collected rocks before adding soil. There are many perennial herbs that, once planted, will return the next year. Common perennial herbs include: mint, thyme, sage, lemon balm, oregano, chives…etc. Some herbs are hardy enough to be sown directly into the garden. These herbs include: dill, cilantro, and chervil. These can also be difficult to transplant, making direct sewing a good idea. Additionally, these herbs may need to be reseeded every 3-4 weeks during the summer to ensure a fresh supply. It is important to do some research about how best to start your herbs once you’ve decided which herbs you want and where and how you want to grow them. Each herb has it’s own planting window that can vary based on which zone you live in. Be sure to do your watering (as with any plant) in the mornings or evenings so the sun doesn’t fry the leaves. Keep an eye on the weather, as overwatering can make for less potency in some herbs. Most herbs are happiest, once they’ve established themselves, being pruned regularly. This shouldn’t be too hard, as you’ll want to pick sprigs for cooking and teas anyways! However, it is important to clip leaves and pinch sprigs off at leaf intersections, taking, at most, one-third of the plant’s total foliage so that it is able to regenerate. Culinary herbs can be frozen and then used year-round to add fresh flavor to any meal. You can freeze whole sprigs in a freezer bag, or simply freeze chopped herbs in water in an ice cube tray and keep in a sealed container in your freezer until you wish to use them. Then you can add them straight to the pan or pot to cook. You can also dry herbs and brew delicious medicinal teas. As Beatrix notes, “many common culinary herbs such as sage, parsley, thyme, [and] peppermint, which are great herbs for a beginning herb garden, can also be used to combat common health issues.” She goes on to explain that teas made from thyme can be used to help treat coughs; peppermint is good for digestion; and sage for sore throats. To dry simply lay them out on a paper bag, or place in a dehydrator (times will vary depending on the plant). Lemongrass can be used in a Thai coconut soup or in a broth to poach salmon. Mint is delicious in fresh veggie salads; try cucumber, tomato, red onion—have fun experimenting with the flavors. Savory, thyme, and garlic make for a good white bean soup. Thai basil chicken is a great dish, or for a slightly new take on a classic, try Thai basil pesto. Lavender, chamomile, mint, lemon balm, nettle, Echinacea, and many many more herbs can all be made into delicious health enhancing teas by simply drying the herbs on a paper bag or in a dehydrator, then brewing them in a tea basket. 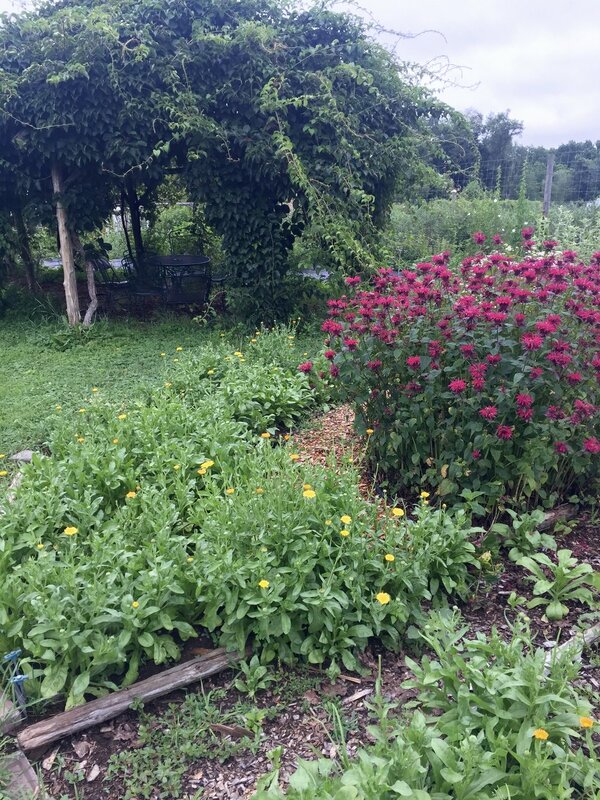 Beatrix will tell you that “Many plants we consider weeds have herbal properties that can be used for healing,” so feel free to research and experiment with all kinds of herbs after you have established your traditional favorites. Not only that, she says that in the spring, she eats her weeds; “I make salads with lamb’s quarter; I eat a lot of nettles”—and I double-checked with her—she says you must sauté or steam the nettles first to kill their sting (anything you would normally do to cook spinach). I look forward to giving it a try (after using gloves to harvest and prepare, of course). The best thing to do is to pick herbs that speak to you. Whether you lean more towards culinary herbs to spruce up your kitchen creations, or medicinal herbs as a safe and healthy way to boost your immune system, find the herbs that enrich your life. To your herb garden from ours, wishing you happiness and health. We are excited to offer our annual Using Gardens to Teach Summer Institute for Educators again this coming August 23-25. Below is a letter from Nicole Cardish, one of our 2015 participants, to a colleague. We just saw Nicole a few days ago when she picked up seedlings that PFP donated to the Mill Road School Garden that she manages in Red Hook. She was thrilled to be planting with the students and teaching in the garden. As suggested by her note, Nicole has started a vermiculture bin and has just initiated classroom composting for snack time and the kids are loving it! She and the students are also growing a wide range of vegetables in the garden for tastings and preparing simple snacks. From left to right: Susan and Nicole collect and process seeds from Glacier Tomatoes; Nicole and Stacy prepare a healthy garden-fresh snack; Nicole and Isaac find the area and perimeter of a garden bed; Nicole picks up PFP-grown seedlings for the Mill Road School Garden. In thinking about complex sustainable agricultural techniques, it is easy to think only of modern innovations. In fact, many traditional agricultural communities have developed extremely resilient, efficient, and sustainable techniques. One such technique is companion planting, an agricultural technique where two or more crops are planted together in a single plot.